The Grand Cherokee lineup is broad enough to encompass luxury as well as the rugged capabilities for which Jeep is known. When the Grand Cherokee was redesigned back in 2011, I spoke to some members of Jeep management. The term that stood out in their description of the Grand Cherokee was “American Range Rover.” But the Cherokee has a personality and charm that go well beyond the English sensibilities of the Range Rover. 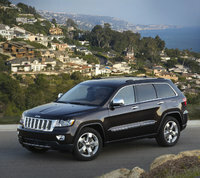 And to prove that point, look no further than the Grand Cherokee Trailhawk. I’m not going to hide the fact that I like Jeeps. From the Wrangler that can pretty much go anywhere, and do it with the roof off, to the fourth-generation Grand Cherokee, it’s a brand that represents an American motoring ideal. Jeep's outstanding off-road capabilities plus its upscale interiors equates to a brand that has a long-running cachet in the minds of buyers. 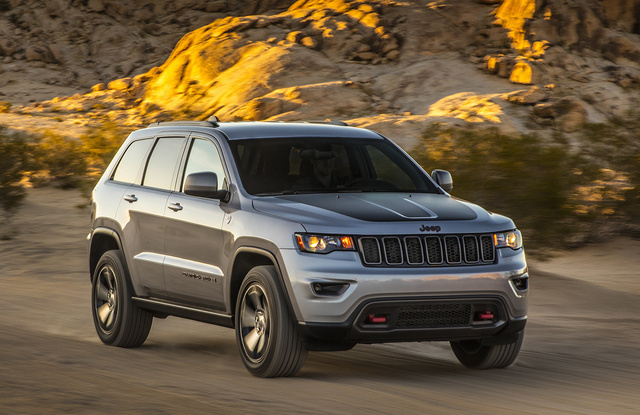 And the Grand Cherokee is the on-road/off-road range-topping vehicle in Jeep's lineup. The current-generation Grand Cherokee arrived in 2011, and Jeep updated its design to what you see here in 2014. The Grand Cherokee has a look that crossovers like the new Compass aspire to, with the iconic seven-slot grille and LED headlights. The 2014 update brought in thinner head- and taillights and feels like the perfectly proportioned SUV, with a squared off-look, rounded edges, and impressive approach and departure angles. Jeep has never been shy about offering variety, and the 2017 Grand Cherokee is no different. It's available in Laredo, Altitude, Limited, Overland, Summit, and SRT performance trims, among others. Most of these offer varying levels of content, comfort, and luxury, but then you’ve got the Trailhawk, which is a whole different beast… and we really mean beast. The Trailhawk was originally offered in 2013 and for just one year, but now it’s back and features unique 18-inch wheels wrapped in all-terrain tires, additional skid plates, a matte black hood to keep glare down on the trail, and those signature red tow hooks. The Laredo is the base trim and comes with fog lights, halogen quad headlights, 17-inch painted aluminum wheels, dual-zone automatic temperature control, a USB port, and a leather-wrapped steering wheel with audio controls. Move up to the Limited for leather seating, power-adjustable driver's and front passenger seats, heated front and second-row seats, 18-inch polished wheels, and a body-colored front fascia with bright insert. The Overland ramps it up with LED fog lights, automatic high beams, a dual-pane panoramic moonroof, 20-inch polished aluminum wheels, rain-sensing wipers, perforated Nappa leather, and the 8.4-inch Uconnect touchscreen. The Summit lives up to its name, with headlight washers and unique 20-inch wheels, chrome inserts, LED fog lamps, and an exclusive fascia design. 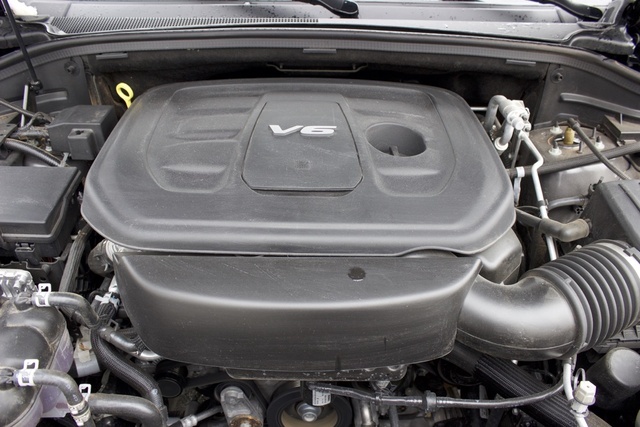 The base engine in the Grand Cherokee—and the engine in our model—is the 3.6-liter Pentastar V6. It makes 293 horsepower, sent through an 8-speed automatic transmission. 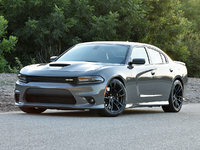 You can also get a 5.7-liter Hemi V8 that makes 360 horsepower or a 3.0-liter EcoDiesel V6 engine that makes 240 horsepower and 420 pound-feet of torque. Power gets sent to the rear wheels or one of multiple 4-wheel-drive systems. Quadra-Trac I is the base system, and it lacks the four-low option many drivers seek. Quadra-Trac II offers low-range, neutral (for shifting into four-low), and has a 4-All-Time mode, which operates as full-time 4-wheel drive. Then you’ve got Jeep’s Quadra-Drive II 4-wheel-drive system, which can be found on the Trailhawk. This drivetrain features a two-speed transfer case and an electronic limited-slip rear differential. That’s the type of off-road equipment many folks look for, but then Jeep ups it with an awesome air suspension system, which is also standard on the Trailhawk. Air suspension isn’t something that was once ideal for an off-road vehicle, but rather luxury cars. Now many SUVs offer it for a blend of on-road comfort and off-road capability. Other trims of the Grand Cherokee offer the air suspension, but on the Trailhawk, it's tuned for additional suspension articulation and results in an increase in ground clearance of four-tenths of an inch. 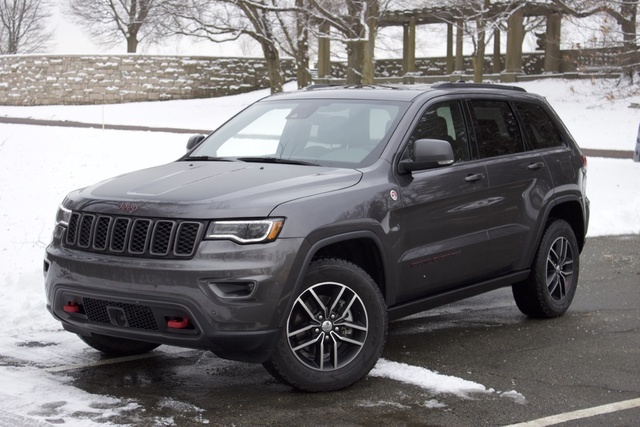 With the air suspension and the ability to select Snow, Sand, Mud, Rock, and Automatic drive modes, the Grand Cherokee Trailhawk is an exceptional off-road SUV. It might not be as rugged as a Wrangler Rubicon, but it’s a far more well-rounded vehicle. The Trailhawk also has Selec-Speed control. This allows you to set a low speed for the vehicle that it will maintain while you focus on steering inputs on the trail. It’s basically cruise control for off-roading. With all this trail-ready gear, you might think the Trailhawk would be a pain to drive on the commute, but you’d be wrong. The air suspension firms right up and helps this 4,800-pound beast corner surprisingly well. The ride is a little stiff at times, but honestly no more so than in a performance SUV like the X5 or Porsche Cayenne. That’s a pleasant surprise. The Grand Cherokee Trailhawk comes with half-suede, half-leather seats, and they do a solid job keeping you bolstered when off-roading. That means they also do a great job keeping you in place going around corners. 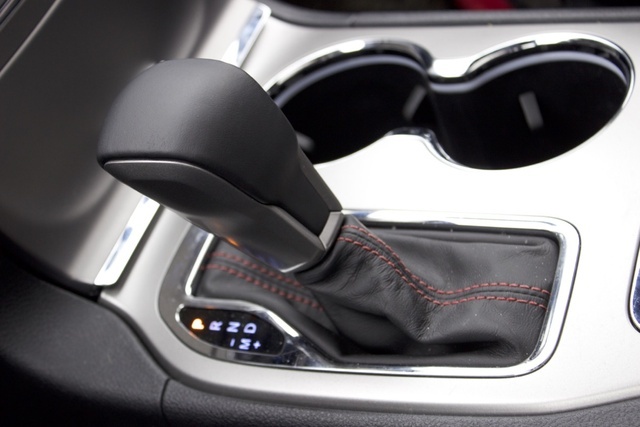 The Grand Cherokee has straightforward controls, which is a great thing for an upscale vehicle. Many luxury SUVs have unique controls, maybe to make the vehicle they're in look more exotic, and the result can be a terrible user experience. One of the major items is the move from a unique “tap” style shifter, to the more traditional shifter layout. 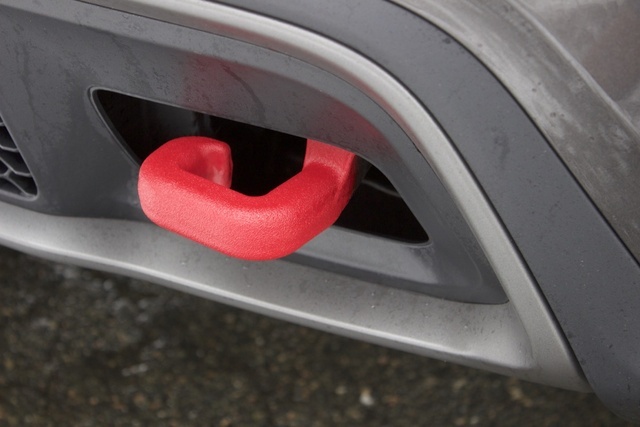 With such an important part of the car, we’re glad to see an easy-to-use design. The Grand Cherokee has plenty of storage solutions—whether it's cubbies and large cup/bottle holders in the doors, a decent-size center-console bin, or the helpful bin with a retractable door in the base of the center stack. The 60/40 split/fold rear seats fold seamlessly into the floor for a flat cargo-load floor. With the rear seats up, the Grand Cherokee has 36.3 cubic feet of cargo space. Fold the rear bench, and that increases to 68.3 cubic feet of cargo space. 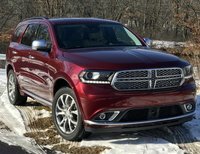 Among some targeted rivals, such as the Ford Explorer, BMW X5, and Acura MDX, the Grand Cherokee fits somewhere in the middle. The Grand Cherokee bests all these rivals on basic cargo (behind the backseat) space. With the rear seats down, the BMW X5 has less total cargo space, but the Explorer and MDX best the Jeep, at 80.7 cubic feet and 90.9 cubic feet, respectively. 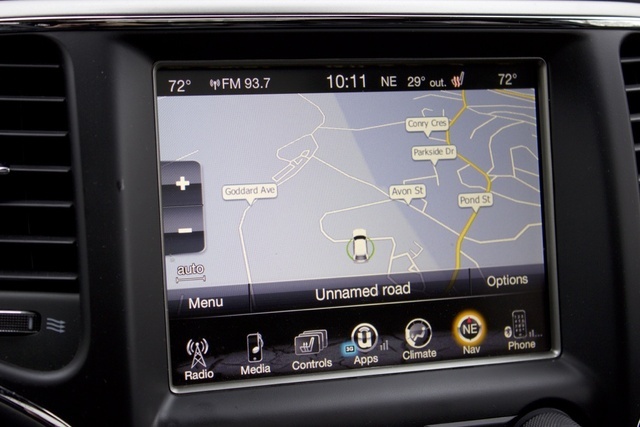 The base infotainment setup is the Uconnect 5.0 touchscreen display system, which comes on the Laredo and Limited. As a base system goes, it’s pretty comprehensive and features vivid graphics and easy-to-read fonts. It provides climate controls and menus for things like the stereo, settings, and Bluetooth hands-free connectivity. Move up to the Trailhawk, Overland, or Summit, and you get the larger 8.4-inch Uconnect screen. I basically consider this the best infotainment system on the market. It might not have the prettiest graphics or the largest screen, but it has a familiar layout for anyone who has used a smartphone or tablet. Controls are easy to use, and it understands complex voice commands. The base stereo is a 6-speaker unit, while the Trailhawk and Overland trims come with the 506-watt Alpine premium audio system, which features 9 speakers and a subwoofer. And if, for whatever reason, that isn’t enough sound, the Summit offers an 825-watt Harman Kardon sound system with 19 speakers. The Jeep Grand Cherokee comes standard with a full complement of front and side impact airbags, electronic stability control, hill-start assist, and a reversing camera. It also comes with the rear park-assist system, which will help when parking. 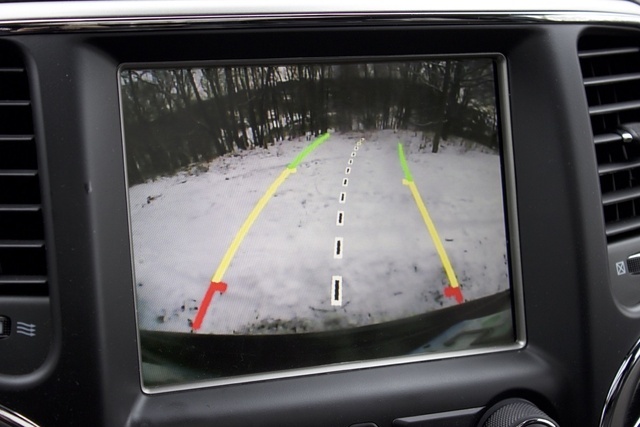 You can also get the Grand Cherokee with forward-collision warning, lane-departure warning, blind-sport monitoring, and front and rear parking sensors. It can also be had with the self-parking feature, which can locate an open spot as you’re driving by it—parallel or perpendicular. Once you find the spot, you follow instructions on the instrument panel. Namely, you take your hands off the wheel, shift into Reverse/Drive, and apply/take your foot off the brake. It's an incredible system and will make parking in the city or a packed garage a snap! The Jeep Grand Cherokee earns a 5-star Overall crash rating from the National Highway Traffic Safety Administration. It also earns a best score of Good from the Insurance Institute for Highway Safety in moderate overlap front, side, rear, and roof-strength crash tests. Base MSRP for a 2017 Jeep Grand Cherokee is $30,395. The Altitude starts at $36,195. A Limited starts at $37,995, while an Overland starts at $44,795 and a Summit starts at $50,495. The Trailhawk trim starts at $43,095, and with various options, the sticker price on our test model was $50,220. As for the previously mentioned rivals, the Acura MDX starts at $44,050 and will go past $60,000 with options. Given the combination of off-road and luxury credentials present in the Grand Cherokee, it falls into very unique company. This combination is also found in vehicles like the Land Rover Range Rover, Toyota Land Cruiser, or even the Mercedes-Benz G-Class. Of that group, the Toyota is closest in price, but it starts at almost $84,000. The Range Rover starts at about $85,000. The G-Class starts at $120,000. So when you consider its comfort and capability credentials, the Jeep Grand Cherokee offers an incredible value. What's your take on the 2017 Jeep Grand Cherokee? RomansTenNine I am looking at a Laredo 4x4. Are there any changes for 2017? Scotty I own a 2017 Limited, only have owned it for a short time. What I don't like is that there is a bit of transmission lash that goes clunk now and then when initiating your driving. But on the road the 8 speed transmission in pdk/tiptronic mode is actually very nice especially for running the car in 'lower gear' mode on steep highway grades. The main transmission selector is very simple there is only P, R, N, and D which I like a lot in conjunction with the L, L1, L2 being your ability to auto shift as I said above instead of there on the main gear selector. It even has paddle shifters which I don't like I prefer using the well designed shift lever in pdk/tiptronic mode. I think I am going to end up really liking this transmission. My 3.6 V6 actually has a somewhat satisfying exhaust note. I find that I actually do not like 'sport' mode because making the throttle response quicker on a fairly heavy SUV makes it feel less than smooth. I really like the offroad application with the additional engine real time readouts for temperature and pressure. (That only comes with some of the higher end 4x4 jeeps). Have you driven a 2017 Jeep Grand Cherokee? I disconnected my negative on my start stop battery and accidentally hit the positive with my wrench which caused sparks. Now my start stop doesn’t work. What can I do?